Tiny snowflakes have always evoked big questions. Descartes marveled at the intricate details observable to the naked eye, which led to advances in the application of mathematics to the natural world. Johannes Kepler found snowflakes compelling enough to take a break from his groundbreaking work in astronomy to speculate about the hidden laws of nature that mysteriously weave such complex creations. 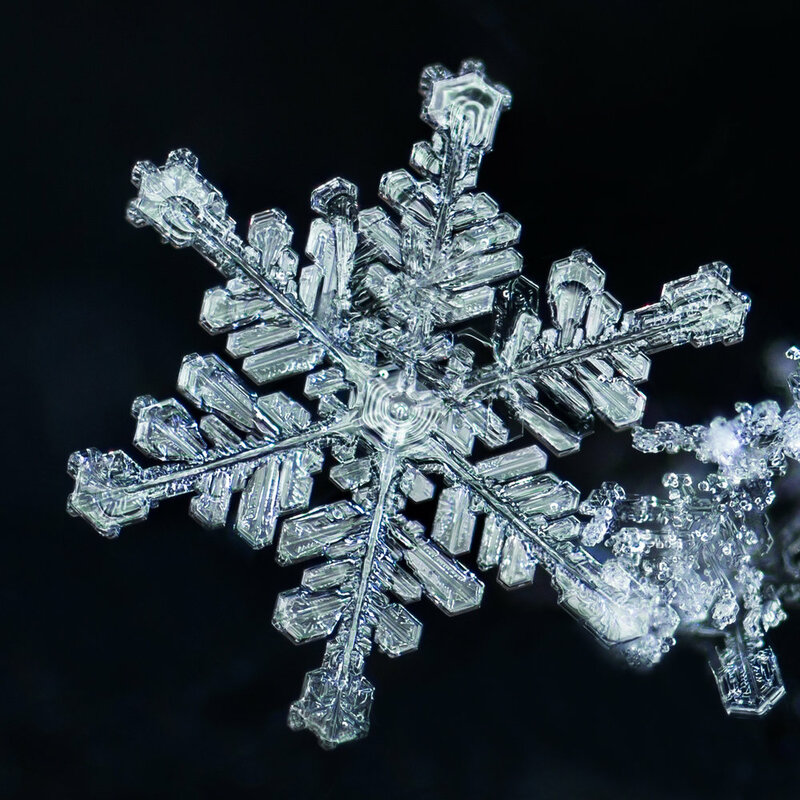 With the help of innovations like X-ray crystallography and scientific labs dedicated to growing the little crystals, most of the big questions about snowflakes have been answered. 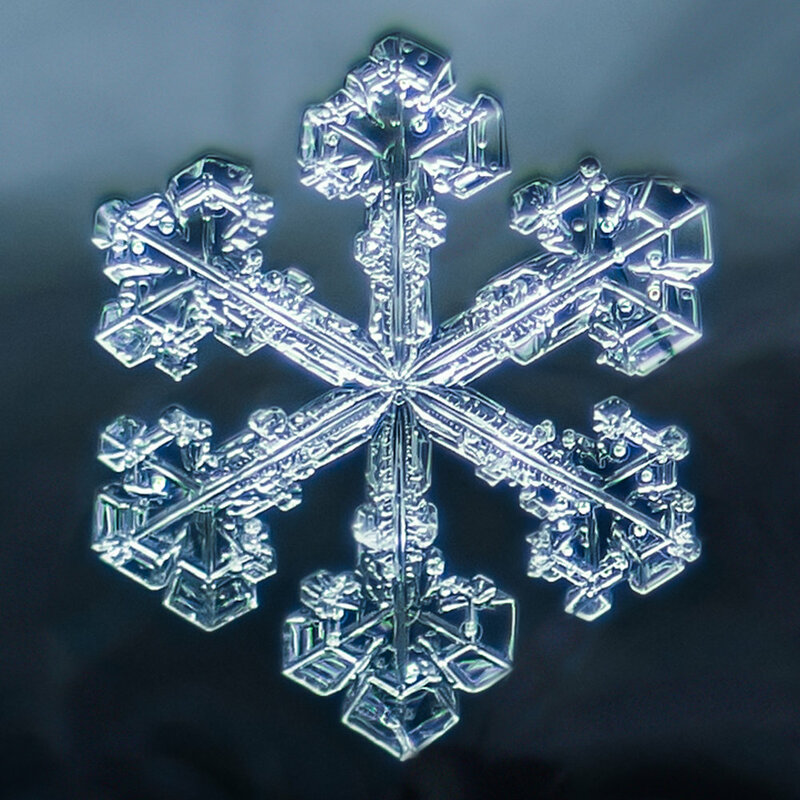 We now know about the six-sided connections of oxygen and hydrogen atoms in water molecules that express themselves in the hexagonal shape of snowflakes. We know that temperatures, humidity levels, and fluctuations in those conditions in the sky lead to the variations of what we see flutter to earth. Wilson Bentley is perhaps the most famous snowflake watcher. As a teenager he developed a passion that led him to take the first photograph of a snowflake in 1885. He spent his whole life capturing these images on glass plates from his farmhouse in Jericho, Vermont, which culminated in the publication of his book, Snow Crystals, in 1931. He wasn’t a famous philosopher or PhD in physics, just a farmer filled with fascination for one of the great earthly wonders. 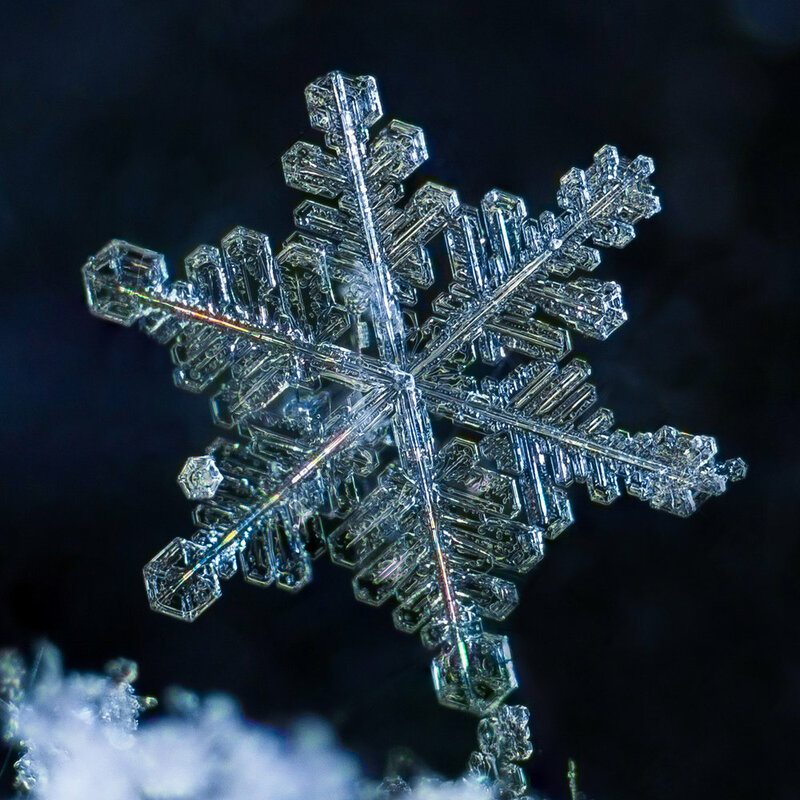 While Bentley’s pursuit required him to invent machinery and innovate techniques, today snowflake photography is accessible to just about anyone with a digital camera. A few years ago, I took a closer look myself, and became enchanted with the extravagant beauty of snowflakes, and slightly obsessed with learning to photograph them. There are many others who have perfected the practice, but here’s a description of what I’ve learned. 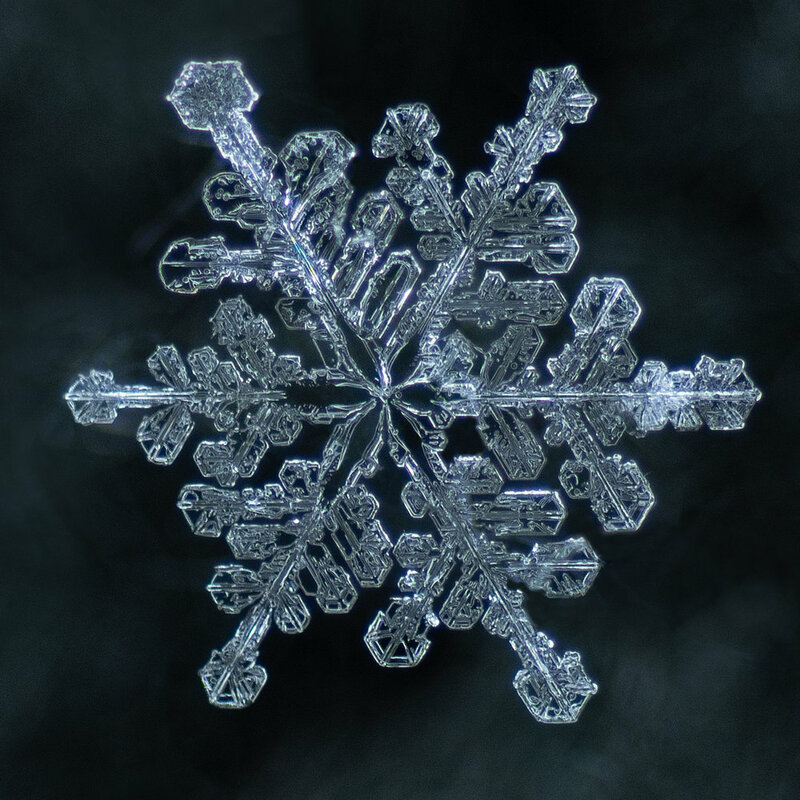 Hopefully this will help all the other snowflake watchers out there, who want to take a deeper dive into the tiny world of snow crystals. I use a Nikon DSLR camera. I’ve used different camera bodies through the years, but any digital camera should do the trick. An entry level Nikon D3500 is a good place to start for under $400. The more consequential component is the lens. It’s important to have a lens that has a close focus distance, which is position the front of the lens can get to the subject, and be able to focus on the subject. I use a Tokina 100mm macro lens, which is available as for Canon and Nikon, and is relatively inexpensive at around $350. I also use what’s called an extension tube, which goes between the camera body and the lens, magnifying the image projected onto the sensor of the camera. You can find some that will meter with the camera body, and allow you to set the aperture in camera. I’m cheap, so I use the $10 special by Fotodix, which means I set the aperture on the lens. If you go this route, you’ll want to make sure your lens has manual aperture settings. Another helpful piece of gear for snowflake photography is a ring flash, which fits on the end of your lens, and provides nice, even light. I’ve tried off-camera flash and flashlights, but the ring light provides the best and most consistent results. You can spend a lot of money on a top-quality ring flash, but I’ve had good luck with a $75 off brand. I use mine in “light mode,” so the light is continually on, to help with focusing, so I recommend getting one that allows a constant light source. The last essential bit of equipment is a surface on which to catch the snowflakes. I use an old black knit hat. It’s helpful to have something with an uneven surface that will hold the snowflake up above its surroundings, which will make for a better background. No need to buy this. I suggest looking around your laundry room, probably in the back corner of a closet, or under the dryer. You’re likely to find the perfect snowflake catcher next to all the lost socks. Here’s what my set up looks like. I’ve found that the colder it is, the better specimens you’ll find, and the less likely they are to melt as you anxiously to try to get them in focus. When the conditions are right, I stand on the steps of our porch and hold out my trusty black hat, like an offering plate awaiting wintry treasures. Be aware that you may get strange looks from neighbors as they shovel their driveways. Just smile and remember that you stand in the proud tradition of snowflake eccentrics around the world. I inspect the offerings until I see something that looks interesting to the naked eye, usually an individual flake that isn’t tangled up with others. 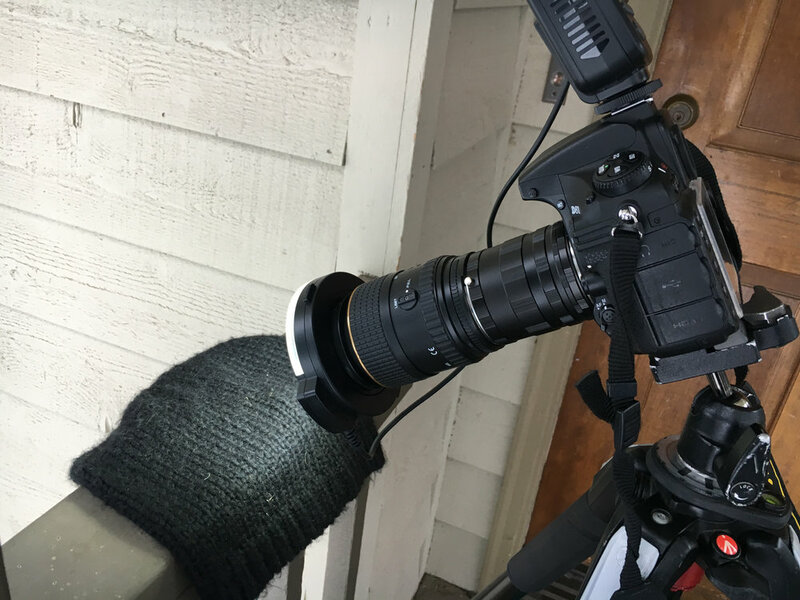 I place my hat strategically on the porch, where it’s cold and protected from the snowfall, and do my best to situate the camera lens so that it is parallel to the surface of the snowflake. This is key for getting the whole snowflake in focus. Some people use precision equipment that allows for stacking multiple images, with different focus points to get the whole flake in focus, but I’ve never had much luck with that, so I do my best to get it all in one single exposure. 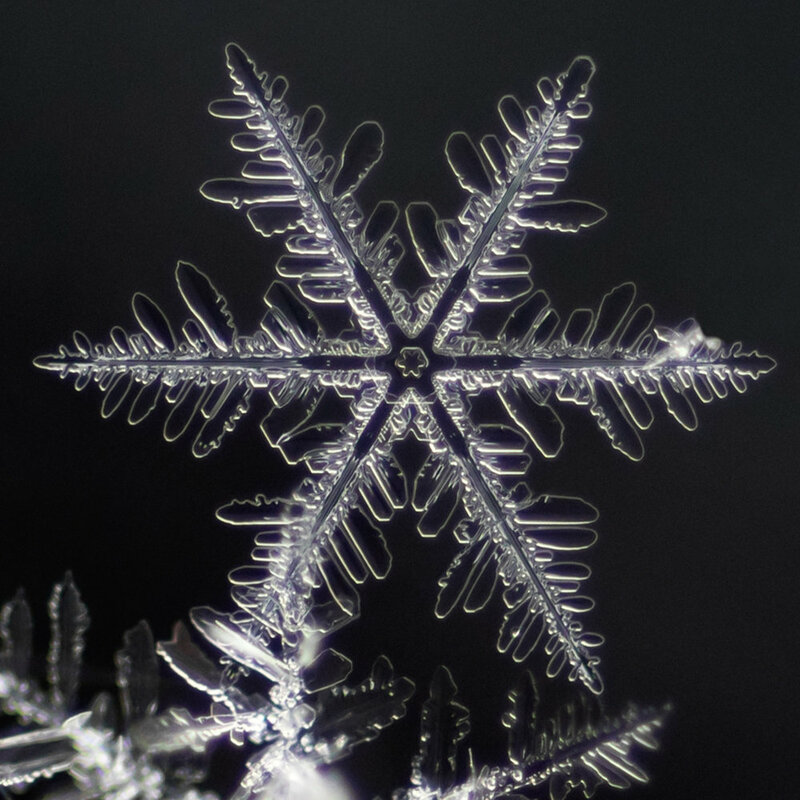 I get the snowflake in focus, as best I can, through the viewfinder, and then I turn on the Live View mode, which allows me to see the snowflake on the back screen of the camera. I use the “+” button, to enlarge it on the screen, and fine-tune the focus. At this point I click the shutter, which I have in shutter-delay mode, so that their is not shake in the camera when the shutter clicks. A remote shutter release would also work nicely. 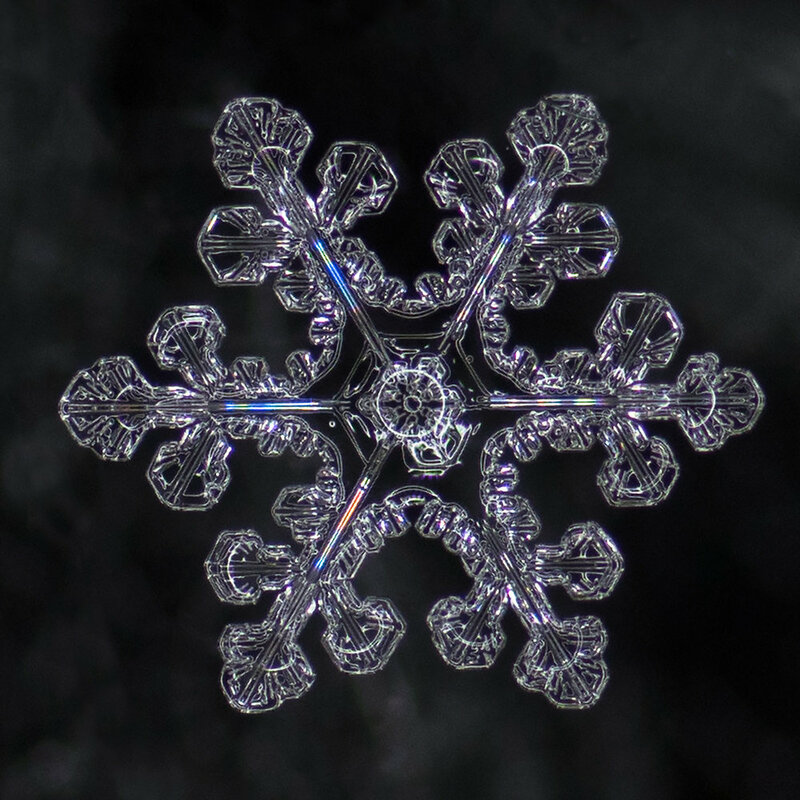 The camera settings for most of my snowflake images are around 1/100 of a second shutter speed, ISO 400, and an aperture of f8. These settings seem to provide a nice balance of depth of field and image clarity. Try not to overexpose, and lose detail in the highlights. Here’s what one of the images looks like before cropping and post processing. I set the white and black points in Lightroom and make sure to click the “Remove Chromatic Aberration” button, to get rid of any purple fringing. I used Photoshop to do some simple cloning to clean up the background, add a touch of sharpening, and rotate to crop in a way that pleases my eye. Here’s what the above image looks like after post-processing. So that’s what works for me. It never gets old to explore the world of these little works of art, and I still find myself asking big questions about beauty and nature and delight, when I see them through the viewfinder of my camera. You can purchase these photos at my online store. For most of my life as a photographer I was constrained by a full-time job as the pastor of a local church. I snuck in photo outings on days off or early in the morning before showing up for work. I could hardly ever travel further than what a day’s round-trip in the car would allow. These limits were certainly frustrating at times, but I’ve come to see this anchored life as mostly a gift and blessing. and Wolf Lodge Bay on Lake Coeur d’Alene to photography the annual congregation of bald eagles. and discovered the wonders of the northern lights at Priest Lake in north Idaho. Along the way I was surprised to learn that there are people that travel from all over the world to enjoy and photograph these places in my own backyard. Go to Steptoe Butte State Park at sunrise on a spring morning, and you’ll be greeted by a half dozen tour buses filled with photographers who traveled thousands of miles to be there. It turns out I live in a region that others might consider a far-away, exotic destination. I’ve certainly been blessed by these rich surroundings, but the reality of most busy days of work and family commitments meant that there wasn’t time to venture further than my own immediate surrounding. When I got home from work at 6 p.m. and the sunset was at 6:30 p.m., I was forced into the non-negotiable math of human transportation. It was always, grab the camera and tripod, get in the car, and try to figure out where I could get to in time to catch some color and light. 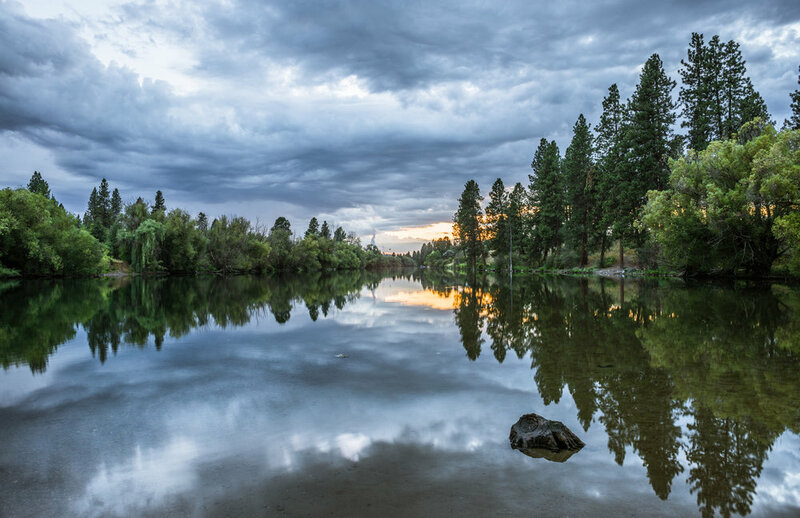 Most days, the subject matter was limited to my own neighborhood in the west valley of Spokane, which is a nice place, but no one has ever mistaken it for a world-class photography destination. I suspect this is the reality for most creatives. The artistic journey is often limited to the margins, snuck in between the imperatives of everyday life, confined to small local places that few would consider unusually fertile ground for a rich artistic life. Our preoccupations with beauty and mystery are caught up in the gravity of ordinary neighborhoods and unassuming landscapes. Despite these limitations, I felt compelled to head out with my camera, and over time, strange things started to happen. I got to know my neighborhood really well. I discovered places that had been hidden in plain sight, and stopped to explore. I developed a keen sensitivity to the rhythms of seasons, weather, and wildlife. Little local adventures became a training ground for my skill and vision as a photographer. Over time, I did get to spend time at famous photo destinations, but my best images always seemed to come from places close to home. I was reminded of this recently when National Geographic featured one of my images on their Instagram feed. I regularly share images to the Nat Geo Your Shot community, including photos of famous wolves from Yellowstone, and iconic scenes from photo destinations like Glacier National Park and Antelope Canyon in Arizona. When the editors from National Geographic recently looked over my photo feed, they skimmed right past those shots and selected a scene from my neighborhood to broadcast to their 1.6 million followers. This is one of those places I discovered in my local excursions. It’s 5-minute drive and 15-minute hike from my house, and has become a go-to spot for sunsets because of the smooth water and westward view. I’ve been there over a hundred times with my camera and tripod in tow. You can scan through this slide show to see some of the photos I’ve taken from this location through the years. I recently wondered what it would look like to include myself in the scene, so instead of hiking, I paddled out with my kayak, and set my camera up to keep taking photos, as I floated around in the frame. 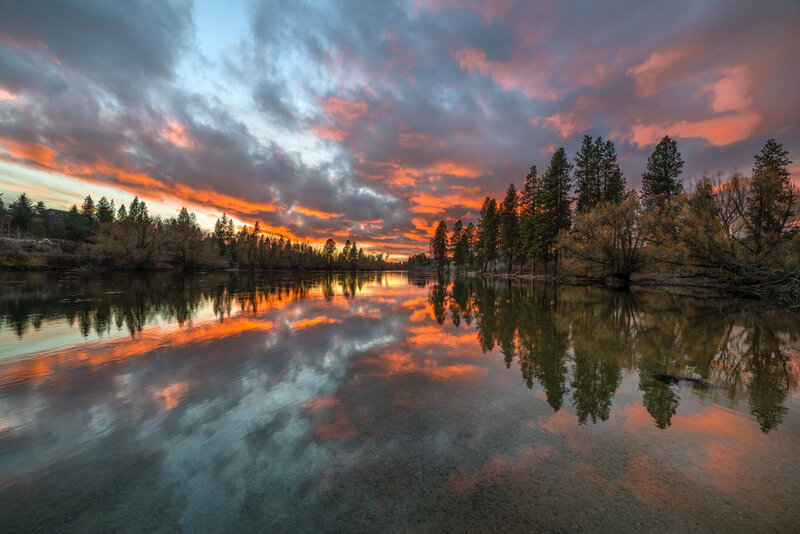 Here are some of those shots, including two that were recently featured by Nat Geo editors. 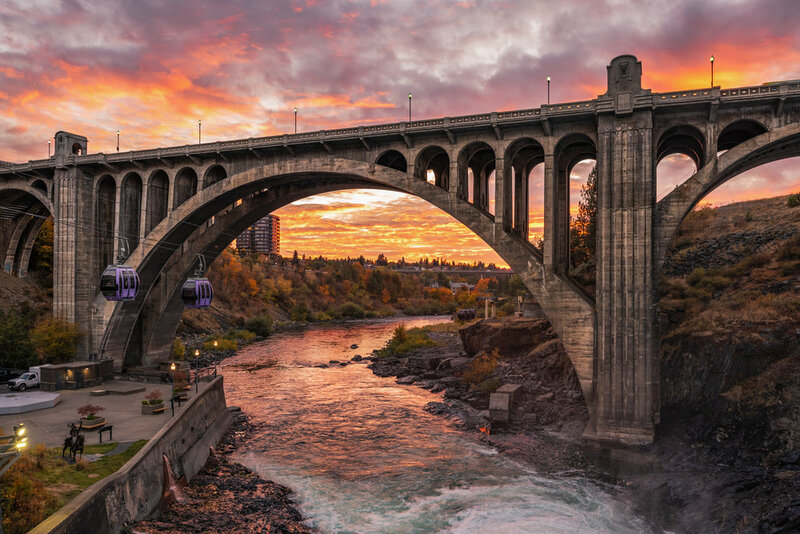 When I moved the west valley of Spokane 14 years ago, it never occurred to me that it was National Geographic material, but now I know the truth, and I suspect that what’s true for my neighborhood is true for yours. In every ordinary and unassuming place, there are compelling scenes worthy of the Nat Geo Instagram feed. Let me offer a word of encouragement to anyone who seeks to live a life of creative expression, but feels stuck in a common place. It turns out that the constraints of being anchored in an ordinary place are not a curse, but can be a gift. Instead of lusting after far-away, exotic destinations, settle down and pay attention. You are surrounded by mystery and beauty that simply awaits the long stay of an attentive eye. I quit my job six months ago to make way for a season of full-time on photography. I thought this new flexibility meant that I would venture further afield, to finally spend some time in those far-off places, but I’ve mostly stayed close to home. There is so much amazing stuff around here, I don’t want to miss it. This was the view from my neighborhood last week. This year I had my first opportunity to visit Mt. St. Helens and see the iconic bloom of indian paintbrush and purple penstemon wildflowers that have flourished since its catastrophic eruption in 1980. I thought this might be my chance to get THAT shot. You know the one. You’ve probably seen it dozens of times on Instagram or Facebook or Pinterest. It’s the wide angle view, with the red and purple flowers close-up in the foreground, and the mountain in the distance. The conditions were perfect, and I was anxious to figure out where everyone was getting that epic image. I’m not immune to stretching the definition of staying on the trail to get a photo, but this is one of the most obviously out-of-bounds areas I’ve seen in my travels. It’s right up there with the boardwalk for the Grand Prismatic Spring in Yellowstone NP, where three Canadian bros recently caused a minor international incident when they wandered out onto the bacterial pad, or Old Faithful in Yellowstone, where the only person I’ve heard of to cross the boundary is a tourist who wandered up to the famous fountain a couple months ago, with an audience of hundreds of people, and peed in the geyser. The wildflowers in front of the Johnston Observatory struck me as an incredibly sensitive and high-profile location that no nature-loving photographer would dare trespass. Having exhausted my quest to find THE spot, I moved on and found some nice scenes along the trail. It really is an amazing natural wonder. As daylight waned, and the sunset approached, we circled back to the observatory, where I was shocked to see a half dozen photographers tromping around in the forbidden field. I was indignant, and yelled at them, “What the #$@#^*% are you doing out there.” It may be the only time I’ve ever sworn in front of my dad. The photogs looked up and shrugged. They didn’t say anything, but I could tell what they were thinking, “I’ve got to get the shot dude. Chill. Everybody does it.” That’s the moment I realized that most of those Mt St. Helens photos I’d been drooling over were taken by wall hoppers and wildflower crushers. I could imagine them saying that they were being careful out there and it wasn’t a big deal. The test for this is whether they would be willing to venture out while the observatory was open, with hundreds of people watching, and a half-dozen park rangers on site. If it was not a big deal, why not do it then? At least the guy that peed in Old Faithful had the integrity to do it in the middle of the day. There was little we could do but walk away in disgust. We went on to enjoy the sunset and a starry night, but I was still unsettled by that encounter with my fellow photographers, so blatantly flaunting the rules and harming the natural resource. 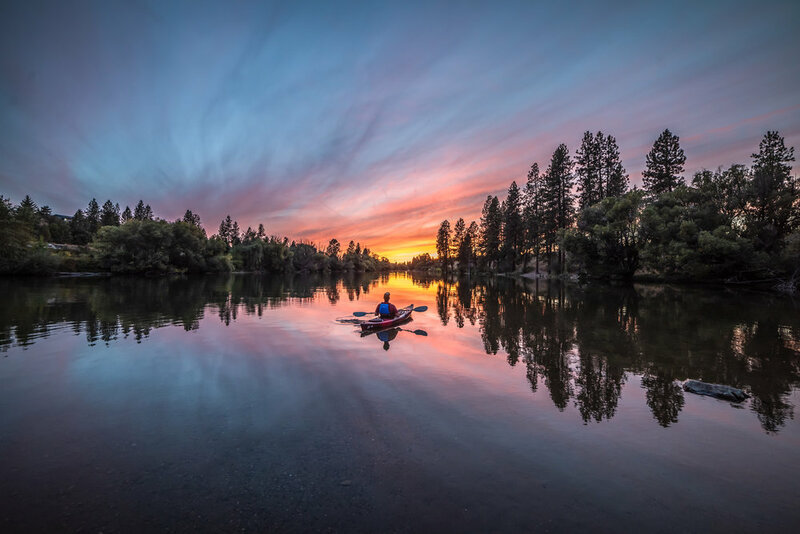 Unfortunately, this week I was reminded of that unpleasant experience when the Washington Trails Association announced the winners of their annual photo contest. It’s become an annual tradition for me to enter photos and enjoy the unveiling of the winners, which this year includes THE shot of Mount St. Helens. The indian paintbrush glows in the foreground. The mountain hovers in the distance. The afterglow of the sunset filters the scene with gauzy pastels. That was the one I had been looking for on my visit to the mountain, and I was almost certain it was taken out there in front of the observatory. 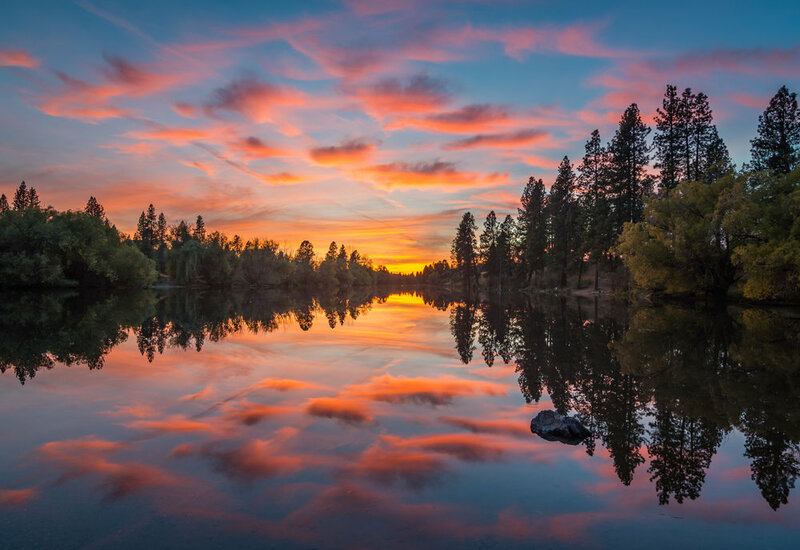 The good folks at Washington Trails didn’t know any better, but the photo contest celebrating our great state’s trails is highlighting a blatant example of disrespecting the trails. I was so alarmed by this development, I went full CSI on this situation. I found a 360 degree view of the area in front of the observatory, and took a screen shot of where I thought the photo might have been taken. I looked for some common features between that and the winning photo and, sure enough, my hunch was right. It appears that it was taken about 20 feet down the hill, in front of the observatory, and right in the middle of the wildflower patch. I hold no ill will toward this photographer. He was just doing what all the other photographers were doing, but I don’t think that field of wildflowers will survive many more years of this kind of abuse. The current feedback loop of social media creates a frenzy around photo locations like this one, which leads to an ever-growing pilgrimage of people who want to get THE photo, especially when it’s an award winner. I’ll leave it to the park rangers to sort out how to police the rule breakers, but I do have an observation from this experience. The worst thing I can do on a photo outing is to start with my creative instincts held captive by other people’s work. That was my big mistake that day at St. Helens. It was only when I gave up finding THE spot, that I was able to see what was in front of me, instead of what wasn’t. This is probably true with most creative pursuits. My best days as a photographer, and a person for that matter, are those days when I’m not pre-occupied with what everybody else does. When I don’t have other people’s pictures in my head, it’s amazing what creative visions bubble up from the mysteries within me and around me. On those days, I often find the adventure of a path less traveled, and I’m also not as likely to crush the wildflowers along the way. Six months ago, I quit my job. After 21 years of being a Presbyterian pastor, I resigned. In retrospect, I can see more clearly what led me to that moment. I was tired, anxious, and restless, still a bit disoriented from a recent sojourn into the badlands of cancer. I was cancer free, but hardly free from the trauma of it all. I was also energized and delighted by an emerging vocation in photography. A chemo-inspired pledge to do an art show led to a small, thriving photo business. My images were starting to show up on the covers of magazines, annual reports, and the National Geographic Instagram feed. I had no illusions that I could make a living from that, but there was a growing tension between being a pastor and being a photographer. In some ways, my resignation was an impulse that churned under the surface for years, but there is one thing I can point to that brought it to the surface and gave it urgency. It was a photo of Grandfather Cuts Loose the Ponies, also known as the Wild Horses Monument, in Vantage, Washington. It’s an art installation of iron horses on a ridge above the I-90 freeway, halfway between Seattle and Spokane. It’s perhaps the most viewed piece of public art in the country, with over 10 million cars passing by every year. I have a photo of the Milky Way above the horses that won a prize at the Spokane County fair years earlier. Subsequent conversations with David Govedare, the Native-American artist who created the statues, had sparked my imagination about other ways to show off this special place. 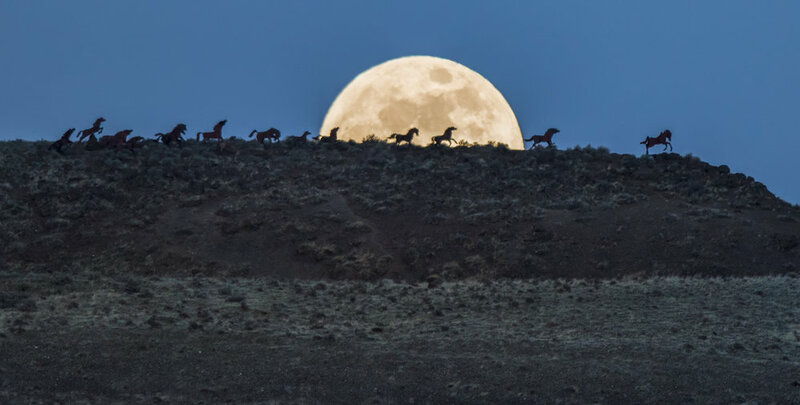 In recent years, every time I drove by, I envisioned a photo of the moon rising behind the horses. I wanted to show the perspective of a massive moon enveloping the whole series of statues on the horizon. The challenge was getting the right conditions and alignment to get the shot. In January, I showed up at my office, as usual, but a news flash about an impending super moon, sparked the recognition that the opportunity had finally arrived. The planets were literally aligned to get the photo, but there was one problem. I had a meeting scheduled that evening with some elders from the church. I started down a familiar path of acknowledging that my creative energies would have to take a back seat to my responsibilities. It’s a familiar path to anyone who has lived within the constraints of a career. The wild horses would have to wait until I had free time. My creative visions would have to pause until I didn’t have so much on my plate. My imaginings would need to settle down, until I wasn’t so locked into a schedule of evening meetings and busy weekends. But something strange happened along the way. I decided I couldn’t wait. I surrendered myself to the muse, and canceled the meeting. I got in my car, and drove 2 hours to Vantage, WA. I set up the camera a mile away from the horses on the banks of the Columbia River, and immersed myself in the anticipation of the moon peeking above the horizon. I finally got to the right spot and had only a few minutes to set the exposure, compose the image, and click the shutter before the moon was past the horizon. With moon shots, there is this fine balance between the moon being too bright and the landscape being too dark. I focused in on the lead horse, and took a few shots, and then it was over. The balance was lost and the moon was too high. I scanned the screen on the back of my camera. I packed up my gear and headed home with a deep sense of satisfaction, and a bit of unease. The experience sparked a recognition that it was time for a change. If you’d like information on the efforts to complete Grandfather Cuts Loose the Ponies, go HERE. All of my photos are available as 5x7 notecards, 8x12 matted prints, and canvas and metal prints. Go to CraigGoodwinPhoto.com for more information. Can you see the Lights with the naked eye? Yes, the glow of the lights along with the structures and shapes are visible. The more intense they are the more visible the colors become, but the sensor of the camera is able to gather up the intensity of the colors in a way that the human eye cannot. I do very little color saturation adjustment on these shots, so the colors are there. We have a tendency to think that what is nakedly visible to the human eye is the most true portrayal of a scene, but in the case of the the Aurora Borealis, we get more of the beautiful truth from the camera than we do with our own eyes. It takes a rare combination of events to see the Aurora in Washington and Idaho. You need clear skies, low light pollution (including lights from cities and the moon), and most of all, you need a large Coronal Mass Ejection or sun flare that directs gases and magnetic forces at the earths atmosphere. Softserve News is my favorite source of Aurora forecasting. Sign up for the free email alerts and that helps, but be warned that it's spotty on it's accuracy. The arrival of material from the sun is hard to forecast and predict. They usually arrive earlier or later than predicted, or not at all. You need a four or five on the scale of intensity to get a good showing in Washington and Idaho. To give you an idea of how uncommon it is to get all these factors to work together, this week's shots mark six months since the last time I had a good opportunity, and I actively monitor the situation. One lesson I learned from last summer is that when there is a large solar storm it tends to linger for a couple days afterward, with lower intensity. This week's storm peaked on Tuesday during the day over cloudy skies. But Wednesday night the skies opened up and my hopes for a remnant of the previous day's storm were fulfilled. The darker the skies the better, but if they are present you can see them starting an hour after sunset up to an hour before sunrise. The map of their visibility is like a disc shape laid over the north pole. The more intense the lights the more the bulging edge of the disc will push out towards the U.S. The further you move to the west, the further up north the disc of visibility moves, and the further east you go the further south the disc dips. It depends on your camera and your lens. The ideal is to have a tripod, a fast lens that goes to 2.8 or lower on the F-stop, a long shutter speed of anywhere between 5-25 seconds, and a high ISO sensitivity setting of 1500 to 4000. A full-frame camera allows you to go higher on the ISO without getting too much noise in the image. Is it worth going to all the trouble to see them? Yes! It's a magical and mystical encounter unlike anything I've experienced in the natural world. An example of this was an encounter I had with a herd of deer on Wednesday night. I was driving to a destination north of Davenport when I came upon a bunch of deer feeding in the fields. I noticed their silhouettes against the sky and had an idea for a photo. I pulled over and walked on the road toward the deer. I forgot to adjust my camera settings, so after getting in position I turned on my headlamp and looked down. When I looked up from newly-tuned camera, the dozens of deer that had been right in front of me were gone. Not a sign or sound or trace. I had a hunch they might move north so I hiked up a road that opened into a sweeping hill. The glow of the Aurora hovered on the horizon and, looking up the slope, I could now see my herd of deer silhouetted against the electric sky. Most of them skittered away in the silence, but I could see them leaping and running, shadow dancers on waves of light. A few were willing to stick around for a photo, but my favorite part of the night was witnessing their shadows leap into the distance in total silence. I was thinking that next time I'll use a different lens and shorter shutter speed, but the truth is that there probably will never be a next time for such an encounter. The Aurora is like that, always offering up once-in-a-lifetime moments.